Yes, this will be a review of Acqua di Parma Blu Mediterraneo Ginepro di Sardegna (Juniper of Sardinia). But first, let’s talk about cologne. What do you think of when you envision cologne? To me, a true Eau de Cologne is a revivifying splash of fragrance that wakes up you then fades away. I want a cologne to apply to my temples if I’m feeling faint, like in old novels, and to freshen me up when the world wears thick and dirty. What I don’t want is a substitute for a perfume. To me, a cologne shouldn’t bill itself as a quick reviver, only to stick around for hours with a thick residue of citrus and resin. To me, that’s simply a mislabeled perfume. I don’t want to smell someone at the office who meant to have simply freshened up with a fragrance after his shower, but who trails the scent like a bad furniture polish for most of the day. For that reason, I’ve had trouble falling in with a number of the “eaux” on the market. If a scent is truly an Eau de Cologne in the classic sense, I want it to refresh and disappear. Otherwise, it becomes — for me, at least — a uniquely obnoxious perfume. And now we come to Acqua di Parma Blu Mediterraneo Ginepro di Sardegna. The “Blu Mediterraneo” line is a subset of Acqua di Parma meant to signal the “hedonistic” Italian lifestyle. Ginepro di Sardegna’s notes include bergamot, pepper, allspice, nutmeg, juniper, sage, cypress and Virginia cedar. Since this is “Acqua” di Parma, and since the notes are cologne-ish, I expect a brisk, refreshing scent. Does it satisfy? Yes and no. Yes, Ginepro di Sardegna is brisk and clean — at least, to begin with. As advertised, it kicks off with a slap of bergamot and pepper on a raft of crushed cypress greens. It projects crisp, acidic freshness. But on Ginepro di Sardegna's heels comes an amber-y, spicy body characteristic of a classic oriental. A cut of cedar, resin, and lingering citrus keeps it from plunging into, say, the territory of a big 1980s oriental. But the overall food-spicy feel is there, and it sweetens further with wood and amber. Most of all, the fragrance sticks around. Although Ginepro di Sardegna is an Eau de Toilette, it behaves like a robust Eau de Parfum and broadcasts a respectable sillage through a full morning or afternoon. After an hour or so, the fragrance is musky and sweet, and any pretensions toward “fresh” are gone. If “fresh” is what you love, and you rejoice in the thought of a fragrance that sounds like a cologne but behaves like a perfume, then you may want to give Ginepro di Sardegna a try. Especially if you yearn for a warm, amber-y woody base with a touch of spice that still tingles a bit. Ginepro di Sardegna bills itself as unisex, but I’d say it skews masculine. If you, like me, want a cologne to show up, refresh, then disappear, you’ll be disappointed. For that, I turn to my chilled bottle of Revlon Jean Naté in the refrigerator. What about you? How do you feel about cologne? Do you have a cologne that fits the bill of the traditional Eau de Cologne? 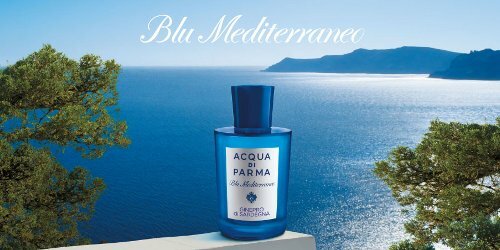 Acqua di Parma Blu Mediterraneo Ginepro di Sardegna is available in 75 ml ($98) and 150 ml ($144) Eau de Toilette. It’s widely available online and in nicer department stores. Eau de Cologne is tricky. I totally agree about the furniture polish bit – that’s only supposed to be temporary and half the fun is the massive amount of spritzing you can do (compared to a regular perfume/edp when you have to be “careful” not to overdo it), and/or reapplying over and over. I think the other problem with EdC is the price point and maybe that’s why people want the longevity? Or maybe it’s b/c they don’t understand the different distinctions in edc, edt, and edp? I love 4711 because I can treat it like water and it never fails to please me. I even spray it as room freshener, closet freshener or on my husbands smelly feet. It always works. On the other hand, I love the fact that my Institute Tres Bien Cologne a la Francaise has the most delicious fuzzy wonderful skin-scent dry down of bitter almonds that nearly smells like iris, and well, it lasts on me for hours. In the end I think I have to judge each one on it’s own merits and what it does for me, although I err on the side of splash splash splash, spritz spritz spritz. Is the Tres Bien Cologne still in production? I seem to remember that the Russe one was pretty fabulous, too. I love your description! Yes, as you say, taking each type on its merits is the best approach. The trick is to test them first so you know if you’re getting a cool-down freshen-up type or a citrusy perfume–very different. I think I saw through some post here over the summer that it must be back in production, but only available in France? Europe? Not here for sure. I feel lucky to have some. I don’t expect cologne to edge towards foodie notes, or sweeten too much. A cologne is comforting because it is refreshing, not because it has a sweet base. If it lasts well, that’s a bonus. I eaux of a former era – Eau de Givenchy and so on. I sniffed O De Lancome from a tester on the weekend and was surprised at how oak mossy it still seems. I spritz my sheets with Guerlain Eau Imperiale, and that’s very nice. I do like the warm patchouli drydown of Eau Rochas, though. But I like cologne to fade, not last–at least, for the most part I do! I confess I like furniture polish. Mostly, I like my cologne AND/OR my perfumes to hand around in a musky and/or woody cloud. (Some of my very favourites fragrances are Eau Fraiche de Dior, Monsieur Balmain and Nicolai Eau d’Ete.) I prefer my furniture polish to be cheap, though. And why is there no Eau de Lemon Pledge on the market?? I like the Dior Eau Fraiche, too. Once I did a long, hot drive–900 miles, to be precise, in one day–and I swear it was the disco music and occasional sprtizes of Eau Fraiche that got me through. I almost think I’d prefer the Pledge. At least it’s useful. Based on the number of times I’ve seen “smells like Lemon Pledge” in perfume reviews, think that there might be tons of inadvertent Lemon Pledge fragrances out there! I thought Chanel Allure Sport WAS Eau de Lemon Pledge? (Am I the only one who finds all the flankers of Allure Homme clunky at best (Allure Homme Sport Cologne*) or obnoxious at worst (Edition Blanche, Sport Eau Extreme)? Personally, I should be getting to know actual Lemon Pledge better to make up for my awful housekeeping…. Ha! Better living through ‘fume-head hobby-dom! I think a lot of it is the price factor, as mentioned already. And of course, how much you like “cologne” style notes. If they are selling cologne at niche prices, then you want it to hang around a bit to be worth your money. For Jean Nate/4711 prices, it’s OK to splash lavishly and only last 15 minutes. I do like citrus notes, so as long as they aren’t too piercing or insistent, I do like them to last a bit -like PdN L’Eau Mixte or Eau d’Ete, Ateliers, and Aqua Allegorias. It’s true what you say about lower priced cologne. Isn’t that the luxury of it, though? I’d love to have a jug of lavender water or fresh, sheer cologne that’s inexpensive enough to apply with a lavish hand. Until then, it’s Jean Nate for me. Of course, if I don’t LIKE the scent that lingers, that doesn’t help, lol! I do love it when perfume evolves during the day. A few weeks ago I heard someone praise the Bond No. 9’s because, he said, they are so linear. “You know what you’ll be getting.” To me, that’s a drawback (plus, I’m not sure I entirely agree with him about the line’s linearity.) I don’t think of colognes as evolving a whole lot–although the Ginepro did. I keep a few eaux in the fridge but the one I reach for most often for a bit of refreshment is Guerlain’s Eau de Fleur de Cedrat. It smells great and then vanishes, although I can detect gentle whispers of it throughout the day. Lovely stuff. I always get two bottles of it at a time! You know, I don’t think I’ve ever sampled that one! On my list it goes. It’s really quite nice, Angela. I’ve been wearing it for about 15 years. I know Cologne Imperial gets more love in the fragrance community but….diff’rent strokes and all that! I will definitely try it the next time I’m near some Guerlains–thank you for the recommendation! You need to finish this poem. I’m also a lavish repeat sprayer so it’s huge refrigerated bottles of 4711 for me. My cologne story: my only trip to Paris EVER was derailed and cut short to two nights and one day for reasons I can’t bear to detail. I lurched wildly about during my one day, stymied, shocked and unable to commit to any revised plan. I stumbled into a beautiful old family-run pharmacy somewhere near Invalides, lined with old wooden drawers and glass-topped bottles, whose owners welcomed me despite my horrible French and probably mad demeanour and sold me lemony cologne in a classic square faceted bottle that their grandfather had developed and sold there for decades. It was a most wonderful souvenir of Paris while it lasted and remains my strongest memory of those strange hours spent in limbo. I am very curious about Thierry Mugler cologne. If any Angel haters rebel and wear it this Friday I’d love to hear about it. Oh, I think you must have stumbled into an alternative dimension! (Or, at least it’s fun to imagine.) I love that story. It’s full of magic. I had a bottle of Thierry Mugler cologne that I used on my sheets before I switched to Eau Imperiale when it ran out. So was Eau Imperiale better or just different? It was different. The Eau Imperiale is shot full of lime, and the T Mugler was more traditionally cologne-like, with an interesting dry fruit twist that I’ve heard described as star fruit. I love Guerlain Eau du Coq and Eau de Guerlain, but the EdG has enough oakmoss (or did) that there is a whisper of it for a couple of hours. I really liked the Institut Tres Bien colognes (I haven’t tried any since they have resuscitated) and we usually have a bottle of Florida Water in the fridge (next to the witch hazel) for when it is sweltering. I’m not sure if I’ve ever smelled Florida Water, but I love the idea of it. I think of voodoo and tropical landscapes. Oh, you’ve got to try it! It’s kind of spicy. I love colognes like 4711 and the old Roger & Gallet Colognes. I love floral fragrances, but I am cautious when I apply them. I never feel like I can over spritz citrus and aromatics. I don’t think of a fragrance as a cologne if it lasts a long time. Lasting power = perfume for me. I love Eau de Guerlain and the Exclusifs de Chanel Eau de Cologne. I enjoy using them solo and layering them over other fragrances. Eau de Guerlain tempers the sweetness of Guerlain’s Terracotta Le Parfum. Chanel’s Eau de Cologne works for me with No. 5, Gardenia, No. 22, Beige, and Bois des Iles. The Chanel Cologne softens the crisp perfumes and brightens the sweet ones. Sometimes when a new scent doesn’t work for me (or even makes me nauseous) I dab or spritz a little eau de Cologne on my wrist. It saves me from scrubbing off the “ewww” fragrance. YMMV, but I love to make these combinations. It is a fun way to play with my sample vials. Gotta use ’em up and make room for more! Now that’s something I haven’t thought of and will have to experiment with: mixing perfume with cologne. What a great idea! A light, top note-heavy cologne could really ease the heft of some perfumes. I keep my Mandragore in the fridge too, along with L’Eau d’Hiver and Roger et Gallet Extra Vieille. Those are my go-to’s when it is hot. Used to love Dior Eau Fraîche in there too! Isn’t it a wonderful life when you can have Mandragore, L’Eau d’Hiver, and Extra Vielle in the refrigerator? Let us all take a moment and give thanks. Angela, your post on this topic and everyone’s contributions really made me think and I am looking forward to a mini eaux journey to explore and test how I feel about it. Yes, let’s all give thanks! A mini eaux journey! That’s perfect. I hope you enjoy the ride! I have a hard time with colognes. If I enjoy something enough to buy it, I prefer that it should last. Especially since I typically leave home from 7am to 6pm. Putting on something that will go in minutes seems pointless for me. That said, I do like “cologne-ish” fragrances that linger on, but do not develop into something else. If the bright original freshness can last all day, with no middle, base note development, than I’m happy! Eau de Courrèges, and Verbena by Durance en Provence are my 2 summer staple. Their freshness is just perfect for me. Thanks for suggesting some “all day” fresh perfumes–I’m sure more than a few readers will be jotting down their names.